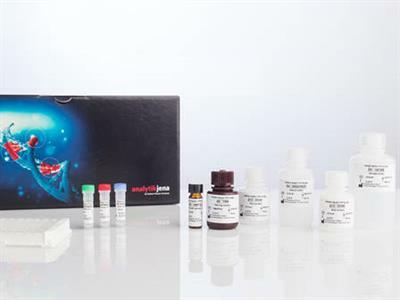 The PRRSV NA/EU TYP ELISA enables a highly sensitive and fast antibody differentiation for type 1 EU (European type) and type 2 NA (North American type) of the porcine reproductive and respiratory syndrome virus (PRRSV) in pig sera. Due to the application of an exactly defined and in regards to type 1 and 2 specificity exceptionally well differentiating antigen mixture that is coated on the immunostrips, it is possible to exactly match the PRRSV positive antibody response to the respective PRRSV type. Control cavities coated with NA and EU as well as negative controls without specific antibody against PRRSV serve as cross-check of all investigated reactions and guarantee a valid test result. Bound antibodies are detected using HRP antibody complex and subsequent ready-touse TMB/H2O2 staining solution. No reviews were found for PRRSV NA/EU TYP ELISA For Veterinary Diagnostics. Be the first to review!